It’s early afternoon on a crisp fall day, and in the lower level of O’Connell House set along Dublin’s famed Merrion Square Kevin Whelan is pouring a cup of hot tea. “Every day there’s a cup of tea,” he says. The director of Notre Dame’s Dublin Global Gateway, home of the Keough-Naughton Notre Dame Centre is speaking literally and figuratively. Since its opening in 1998, the gateway has grown into a hub for more than 1,500 Notre Dame undergraduates who have come here to broaden their intellectual and cultural horizons in virtually every discipline. Or whatever is their cup of tea, one might say. On any given day, O’Connell House is a meeting spot, dining hall, concert hall, classroom or game-watch venue. 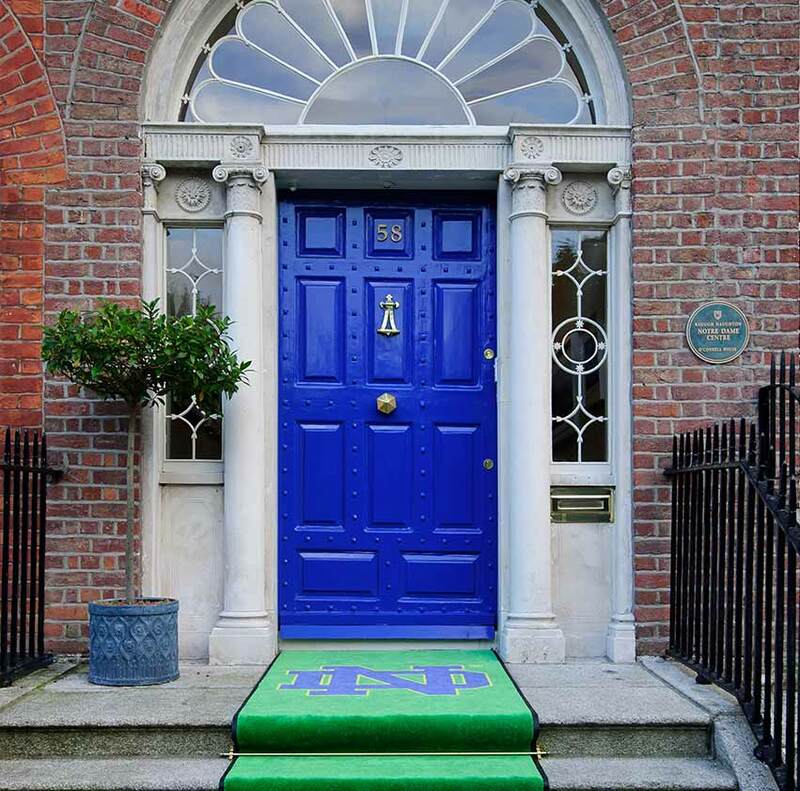 It’s a central point from which Notre Dame students pursue various academic and social endeavors available through partnerships with Trinity College Dublin (TCD), University College Dublin (UCD), the National College of Art and Design, and the Royal Irish Academy of Music. The collaborations capitalize on Dublin’s rich history and culture, and its increasing economic stature (Ireland’s GDP is expected to grow 3.4 percent in 2017). Students learn in the Irish university setting – which, according to many Notre Dame students who have experienced it, can be quite different than what they are used to. And they learn hands-on in more than 50 internship opportunities in a variety of fields. “Whatever they’re interested in, we can get them an opportunity,” Whelan said. Those enticing offerings are one reason the Dublin Global Gateway is among the most popular destinations for Notre Dame undergrads looking to spend a semester abroad. But the appeal of an experience in Ireland runs much deeper, according to Whelan. 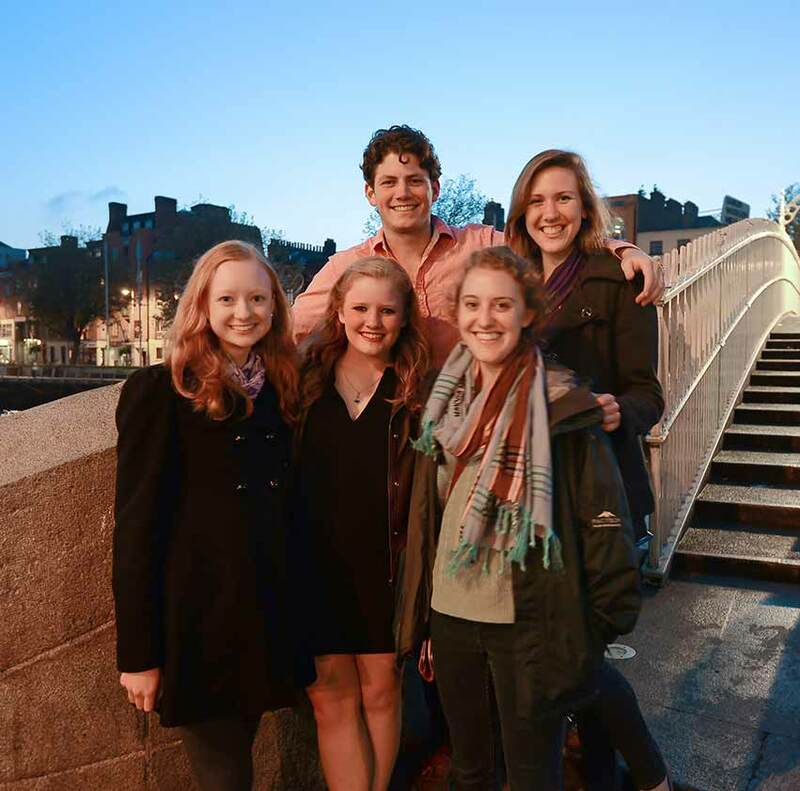 Undergraduate students at Ha'Penny Bridge in Dublin, Ireland. Door of O'Connell House in Dublin, Ireland. The result has been a unique presence of Notre Dame in the country. It’s allowed the University to achieve a certain top-of-mind status when the Irish think of American universities and has created a series of open doors for educational and cultural opportunities. Without question, the notoriety was aided in large part by the 2012 Emerald Isle Classic, when the Notre Dame football team played the U.S. Naval Academy in Dublin’s Avia Stadium. A panoramic photography commemorating the event hangs in Dublin Airport. Cab drivers still ask Whelan when Notre Dame will bring its football team back to Dublin. 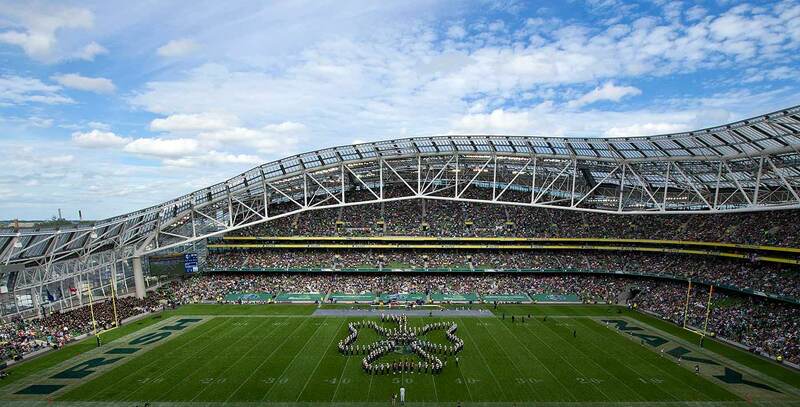 Members of the Notre Dame Marching Band form a cloverleaf during halftime of the 2012 Emerald Isle Classic against Navy at Aviva Stadium in Dublin, Ireland. Two more recent collaborations have served to expand Notre Dame’s physical footprint in Dublin. 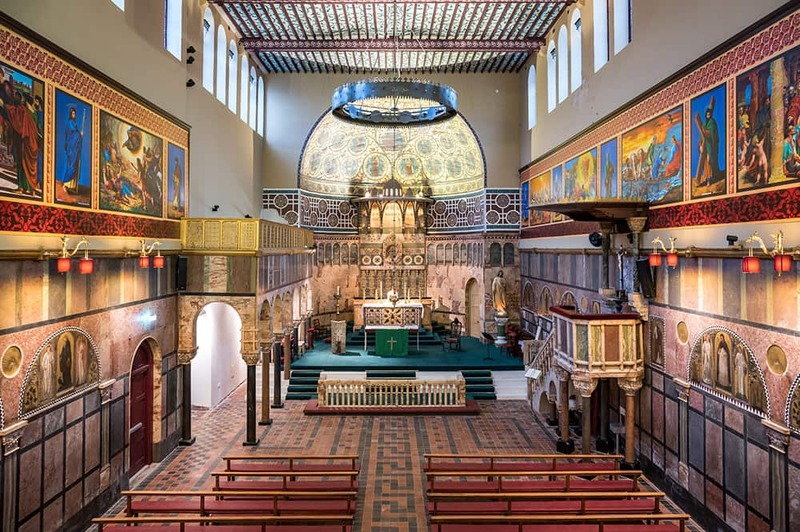 The first is the opening of the new Kylemore Abbey Global Center, a partnership with the Benedectine community in Connemara in western Ireland. The center hosts a variety of academic courses and conferences in creative writing, Catholic education and Irish culture. The second is an agreement to steward the Newman University Church, which opened in Dublin’s city center in 1856. There, Notre Dame opened the Notre Dame-Newman Center for Faith and Reason, which focuses on outreach to young professionals in Dublin, many of whom have not otherwise been drawn to the Catholic Church. 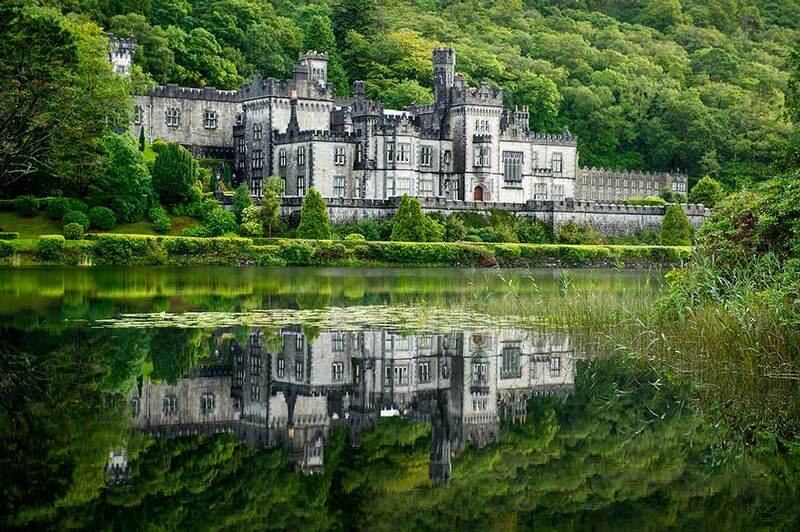 Kylemore Abbey and Victorian Walled Gardens in Connemara, County Galway, Ireland. All of which will help to build a robust academic résumé on paper, but Whelan suggests the Gateway’s deeper contribution to success are the relationships he and his staff form with the students who come here. It starts at the airport, he said. Whelan can usually spot the apprehensive students who may be overseas for the first time. Their body language immediately changes as soon as they see the famous Notre Dame interlocking “ND,” or monogram. (“They could spot one if it was on Mars,” Whelan said.) From that point, the community aspects of Notre Dame are self-contained within O’Connell House. “We’re a condensed Notre Dame, but in some ways we have a bigger responsibility because everything depends on the staff who works here and our relationships with the students,” said Whelan. 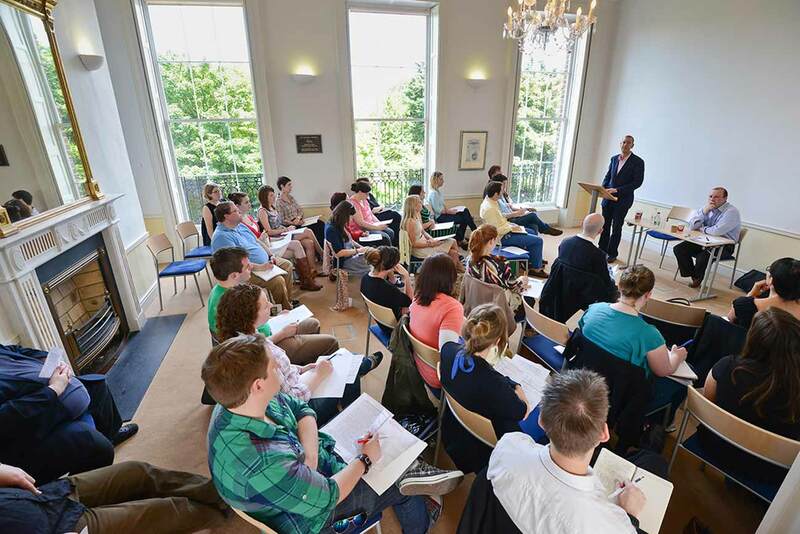 Irish Seminar, O'Connell House in Dublin, Ireland. Sometimes that means something as simple as discussing sports. Other times it’s providing support – emotional and logistical – for a student who has lost a loved one back home. Above all, it’s teaching the students responsibility and character development in an environment that is in some ways more lenient than their homes.